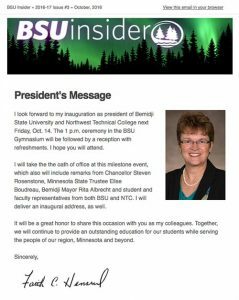 BSU Insider is the internal newsletter for faculty and staff at Bemidji State University. It is typically distributed on the first Tuesday of each month during the academic year, except for January. Submissions for Insider are coordinated through reporters in offices across campus, and can also be submitted for consideration directly to Andy Bartlett in the Office of Communications and Marketing.